Geo Richards 111” Vertical Turret Lathe s/n 1003 w/ Compound Boring Head, Compound Turning and Facing Head, Power Feeds, 111” 4-Jaw Chuck, 7’ Bridge Clearance, 48” Ram Travels. Scheiss 59” Vertical Turret Lathe s/n 375614 w/ 2.9-90 RPM, 5-Station Turret, Compound Facing/Boring/Turning Head, Power Feeds, 59” 4-Jaw Chuck, 45” Bridge Clearance, 50Hp Motor. Sinada mdl. SB-90 Horizontal Boring Mill s/n 115 w/ QMS RDO, 4-1000 RPM, 37” x 43 1⁄4” Rotary Table @ 1 Deg Increments, 27 1⁄2” Quill Travel, Power Feeds, Arbor Support, Out Riggers. Blanchard No. 22D-42 Rotary Surface Grinder s/n 14377 w/720 RPM, 42” Electromagnetic Chuck, 22” Grinding Head, 23” Extended Vertical Range, 50Hp Motor, Custom Jib Attachment, Coolant. 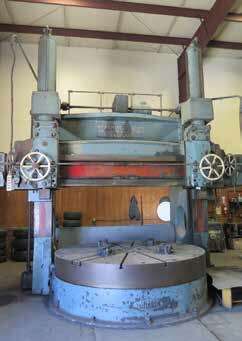 Newall Jig Boring Machine s/n 794 w/ 24” x 36” Table. Rambaudi mdl. V2 Vertical Mill w/ 75-5750 RPM, 16-Speeds, Power Feeds, R8 Spindle. Index Vertical Mill w/ 75-2850 RPM, Power Feed, R8 Spindle. Hardinge Horizontal Mill s/n 23792 w/ Power Feed, Arbor and Support, 6 1⁄2” x 25” Table. Brown & Sharp No.3 14 1⁄2” x 36” Cylindrical Grinder s/n 2975 w/ Compound Grinding Head, Motorized Work Head, Center. Blohmp “Simplex 7” 12” x 30” Automatic Surface Grinder s/n 1700 w/ 12” x 27 1⁄2” Electromagnetic Chuck, Wheel Dresser, Coolant. R.O.Mfg. Tool and Cutter Grinder w/ Dual Grinding Heads, R.O. Optical Comparator. K.O.Lee Tool and Cutter Grinder w/ Motorized Work Head. Boyar Schultz 6” x 12” Surface Grinder w/ 4” x 6” Magnetic Chuck. Hammond No.14 14” Carbide Tool Grinder s/n 2604. LeBlond No.2 Tool and Cutter Grinder. Cutter Master Precision Tool Grinder w/ 5C Air Fixture. Stryco mdl. 24H16 16kVA x 24” Spot Welder s/n 909. NavLine 14” Abrasive Cutoff Saw w/ Stand. Whitney 2” x 2” x 1⁄4” Angle Shear. Standridge 24” x 36” Granite Surface Plate. Pratt & Whitney 15” Compound Rotary Table w/ 12” 4-Jaw Chuck. Vises, Lathe Chucks, Geometric Die Heads, 5C Collets. Hyster 15,000 Lb Cap Gas Powered Forklift s/n C6D3373J w/ 2-Stage Tall Mast, Dual Front Wheels.